Put a large pan of salted water on a high heat bring to the boil. Rinse the rice in a colander under running water for about 1 minute, or until the water runs clear (this will stop the grains sticking together later). Add your rice to the boiling water and wait for the grains to start dancing around. From that point, boil for 5 minutes. Drain the rice in a colander. Pour 2.5cm of water into the pan, put it back on the heat, and bring it to the boil again, then turn down to a simmer. 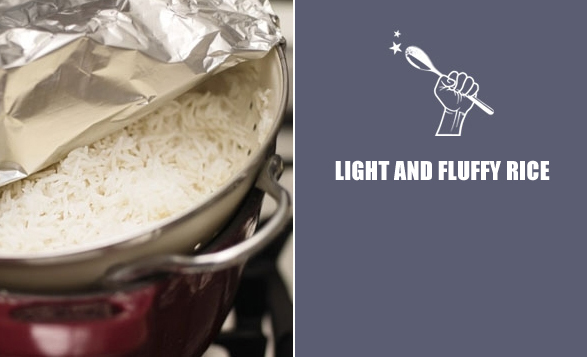 Cover the rice in the colander with foil or a lid. Place the colander on top of the pan of simmering water and let the rice steam over it for 8 to 10 minutes. Remove from the heat and, if you’re ready, serve immediately. If not, leave the foil or lid on and put aside until ready to serve – it should stay warm for about 20 minutes.